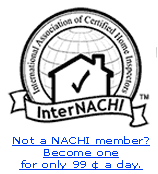 NACHI Glossary of Terms for Home Inspectors – Glossary of Terms for Home Inspectors provided by National Association of Certified Home Inspectors (NACHI). Only 1 dollar Per Day, Join Now! PRO-LAB Professional PARTNERS Program – Providing Certified Environmental Home Inspectors to Real Estate Agents. – PRO-LAB is one of the leading providers of environmental testing services in the world. Once our link is up, send an email to Webmaster – with “reliablelab.com links” in the subject.